Clean and peel carrots, steam until tender. Heat wood chips in a large pot until smoking. Turn off the heat, place the cooked carrots in a basket, cover and lightly smoke for 5 minutes. Place smoked carrots in a food processor with maple syrup, tahini and HELLMANN'S Real Aioli, then blitz until smooth. Refrigerate. Peel and slice onions into rings. Combine the remaining ingredients and whisk to a batter consistency. Dust the onion rings in flour then dip in the batter. Deep fry at 180 degree Celsius until golden. Drain. 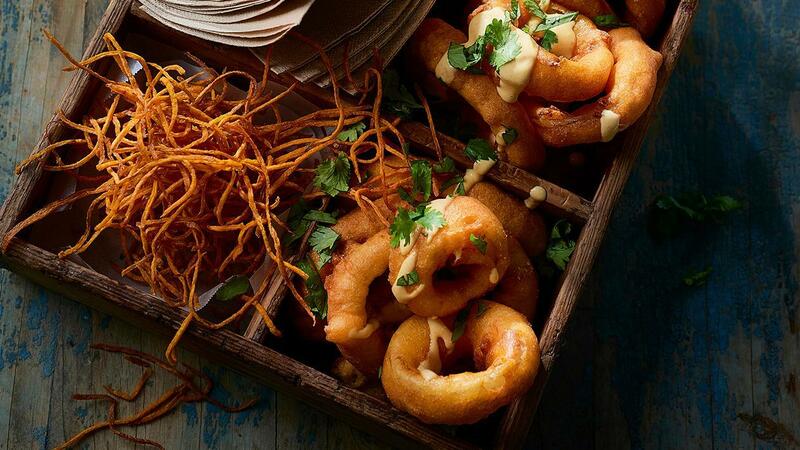 Serve onion rings with carrot dipping sauce.